Spectrolite is a semi-precious gem stone that belongs to feldspars. It is only found in south-eastern Finland in a condense area and in very tiny pockets scattered around Finland. Spectrolite was discovered by accident in 1940 during the Second World War, when stones were being quarried along Finlands eastern border to form antitank obstacles, and now this fantastic jewellery, healing and meditation stone is spreading the message of peace all around the world. 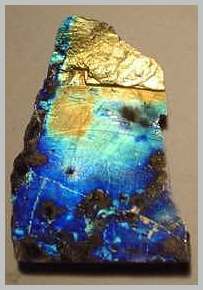 Spectrolite is a member of the feldspar labradorite stone family, but for its colouring, it has very little to do with gemstones called labradorite. 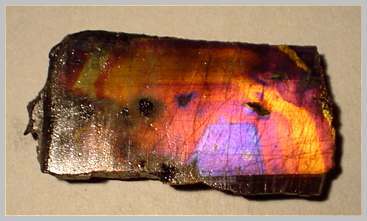 If anything, spectrolite is a Suomilite (Suomi is the Finnish name for Finland), and indeed, it was entitled a gem name of its own because of the rainbow rich variety and depth of the colours it displays - labradorites do not come even close to the brilliance of spectrolite. The Finnish "Stone of Light" was given the name Spectrolite by Professor Aarne Laitakari, who through the name wanted to convey the colours of the Finnish Nature of various seasons. The intense colours range from blues and greens to yellows and oranges. Some rare specimens display all these colours simultaneously. Most valuable, rarest and hardest-to-get-hold-of spectrolite displays shades of red: magenta, pink, purple, violet and the red colour itself. Spectrolite is the only Finnish gem stone that has a quality rating system. According to it, spectrolite is divided into four classes: A+, A, B and C. Raw stones are at Luxonia divided into Best Available Class (containing classes A+, A and B; available readily through Luxonia) and Second Best Available Class (class C and sidestones. 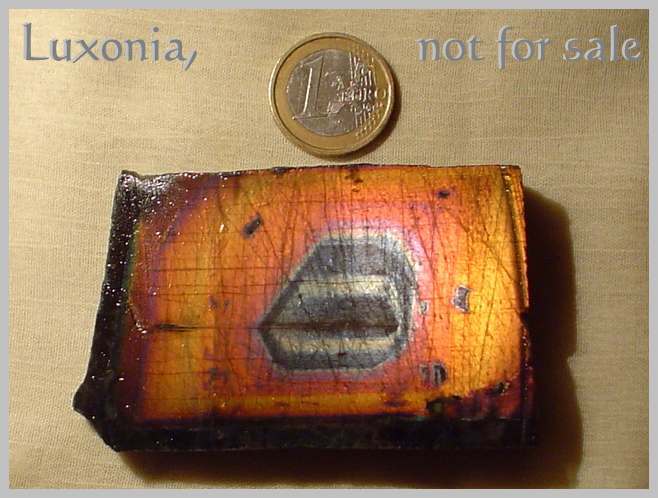 Sidestones are not at all available through Luxonia for wholesale). You can find our B- and class C offering at Decoration spectrolite - sometimes also including up to A+ material, but in a quantity that would not justify displaying the stone at a higher class. Spectrolite is suitable for a number of uses (sculpting, tabletops, tiles, decoration items), but specially suitable it is for jewelry because no two gems will ever be exactly the same - every stone is an individual. The healing properties of spectrolite are presented below. As a healing and power stone, spectrolite has many qualities. Because of its rainbow quality of reflecting various frequencies of light, it enhances the weak auric vibrations of its wearer or user. Spectrolite helps to reach tranquillity and peacefulness, and its effect it multiplied when used in meditation - either held in hand or placed on the third eye; on the forehead. Spectrolite aids the opening of psychic abilities in time, doing it very gently, one step at the time, and it guides you to the wise use of your new abilities. Spectrolite also provides clarity of thought, dispels negativity, improves ones ability to co-operate with others and gives perseverance and strength. All this will not happen overnight but gradually, when your being becomes ready to take the next step in healing and evolution. Spectrolite works like a personal angel guide. When you become ready to make the next step, the step is there. On the physical side, spectrolite works well with sleeping disorders. When a blue - or blue and green - spectrolite is placed under the pillow (wrapped in a scarf or pillow case to avoid possible abrasion), it will in time make you fall asleep effortlessly and sleep deep. It is important to place the stone close to your head that controls your sleeping activities. To re-create a new sleeping pattern sometimes takes some time - and sometimes it works almost instantly - but trust the power of spectrolite. Deep, restful sleep will become reality very soon once you start using your "sleeping stone". If you are a good sleeper, it might be advisable to move a natural, high-vibrating spectrolite slab one or two meters away from you when going to sleep, unless you want to sleep around the clock. Note! Do not use ultrasonic cleaning for spectrolite because of its lamelled structure, and avoid cleansing of spectrolite in salt. Spectrolite is best cleaned with a soft brust under running cool water, or you can leave it to soak in ample water overnight - just like nature would do.